This blog is written by Guido Perosino. It's purpose is to increase the level of knowledge and respect for one of the greatest and most beautiful dog breeds. Pictures and drawings will be used to illustrate the breed's type, morphology and character. The first thing that may come to some people’s minds when they think of conformation showing is a beauty pageant. Some people feel the Leonberger doesn’t belong in the show ring, not because they’re not beautiful, but because they are a working breed. What place does the Leonberger have in the conformation show ring? I asked owner/handlers, breeder/handlers, and judges to find out why they felt it was important to show, not only for themselves and their own companion, but most importantly for the advancement of the Leonberger breed. It is true that the Leonberger is a working breed and some feel it’s more important to see them performing working tasks (i.e., obedience, agility, tracking, search and rescue, seeing eye dogs, water work, service dog work, therapy work, herding, drafting or just being a companion). However, of equal importance, a Leonberger should look like a Leonberger while still being capable of performing working tasks. A good gauge in determining the phenotype, or physical appearance, of the breed is within the conformation ring. The Leonberger Club of America’s Code of Ethics state that the club aims to “encourage the development of high quality Leonbergers” and “encourage cooperation in the improvement and advancement” of the breed. 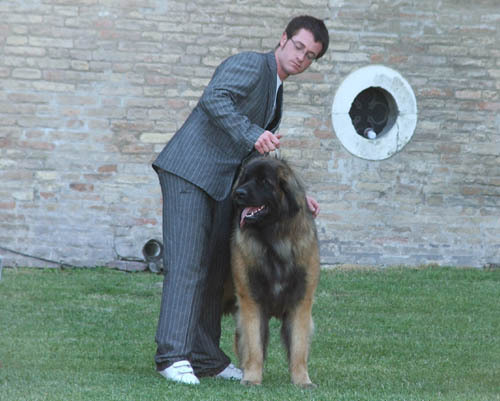 Dr. Guido Perosino, Breeder and FCI Judge, Berljon Kennel, states, “To improve and maintain the typical features of a breed means to select reproducers with reference to the standard.” Without dog shows the advancement of the Leonberger breed would be mediocre at best. The BACL (Breeder’s Acceptability Checklist) is a useful tool for evaluating one dog at a time and to compare on paper. However, it cannot replace the value of attending dog shows and dog showing as an important means to assess and compare many dogs at one time. This comparison is an invaluable tool in maintaining and continually improving the quality and conformity of the dogs we are producing. In the conformation ring at LCA Regional and National Specialties, the exhibitor is presented with a written evaluation and rating of their dog. From the evaluation, breeders and owners can gain valuable insight from judges where their breeding program is effective or determine areas needing improvement. Written critiques and feedback from judges can also be effective in discouraging kennel blindness to the quality of one’s dogs. Educating yourself as to the quality of your dogs is not done in one show but over a course of time. Ann Rogers, Cherrywood Kennel, feels you should get many different judges opinions and from more than one show. She states, “You start to see patterns on strengths and weaknesses of your dogs.” Ann didn’t feel you “should use only one show or one judge or one person’s opinion to make a decision on what you have. Dog show wins reflect a judge’s opinion. Different day, different judge, different opinion.” It’s also important to keep in mind that some dogs and lines will mature at different rates so age will have some bearing on results. Through conformation showing at LCA National Specialties, European judges have given us valuable input on how our dogs measure up to the international Leonberger community and competition. Sarah Mahoney, ForeverGreen Kennel, finds that, “It is always interesting to show the same dog under a number of different judges (from different countries, particularly) to see the differences, opinions and priorities of not only that particular judge, but the country he/she represents.” The European Judges that have judged at our National Specialties have provided us with a window to the international Leonberger world. Since the U.S. is isolated from the European competition as a whole, showing under the European judges has provided us with a broader picture. In addition to the individual critiques provided on each dog, on the last day of the LCA National Specialty, the Specialty Judge always provides an overall assessment of the dogs he/she has judged. This overall assessment allows the LCA Breeders and community to determine what areas we should concentrate on. Breeders will not only look at the prospective stud(s) they are considering but also look at the progeny, brothers, sisters or parents. Breeders may be looking for studs that are prepotent in passing along certain characteristics they would like to introduce into their line or to reinforce a trait that is already present within their breeding program. The conformation ring is an excellent place to see many dogs and many lines in one place, and by showing your Leonberger, the breeder, the judges and the public can see these traits firsthand. Showing spayed or neutered Leos is as important as showing unaltered dogs. Despite the spayed/neutered Leos being unable to reproduce, if there is an excellent representative of the breed, the breeder can look to siblings of that dog. It is of equal importance to show our veterans. The Veterans can give us insight to lines with longevity and good health. Years ago, an all breed judge said to me that all too often, once a Leo has a championship (which is usually at a young age), they are never shown again. In a slow maturing breed like the Leonberger (with some lines taking longer to develop than others), some of the most magnificent examples of our breed are our veterans. It’s also important for all-breed judges to see the beauty of a fully matured and coated Leonberger. The more activities an owner shares with their Leo, the stronger the bond they can develop. You don’t need to be a professional handler to show. Even if you’re a novice handler, showing can be extremely beneficial for both you and your Leo. Teri Whalen, a new Leo owner and new to the conformation ring commented, “I put in a lot of time and effort into socializing and training my puppy. The show ring became our goal. Neither of us had ever shown before and so it was fun to learn together. I have been a spectator at many dog shows, mostly AKC shows. I always watched in awe. The whole process seemed so overwhelming! The venues currently available for the Leonberger are just not as intimidating as an AKC event. There has always been someone who was willing to give advice, critique our run, or just say “good job!” And, every time in the ring is a new learning experience. Most of all, as I have been told from the beginning by some very dear mentors, it has been fun. The relationship we choose to have with our dog is only enhanced by participating in events where performance depends on both dog and handler.” Diane Mulkerin, a Leo owner and novice handler said, “Being new at it is a great learning experience for me, not just about showing but really learning a lot about the breed. I love the evaluations that we get from the judges and like it even more when the judges make their comments out loud so that you can look at all the dogs in the show and know why one dog is chosen over another. I love meeting and talking to other Leo lovers and especially love meeting their dogs.”So even if you’re not showing, attending dog shows can be beneficial. A great deal of knowledge can be gained around the conformation ring just by listening and watching. Although the original intentions of dog showing was for breed selection, dog show aficionados also found that they enjoyed the competition, fun, camaraderie, and socialization of their dogs that came as a result. In the early days of the LCA when the breed was virtually unknown to the U.S. population, a conformation show was a place for gathering and bringing the breed to the public’s attention. It was important and necessary for the LCA breeders to promote and show their dogs. This was also a time when the breeders were able to see how the puppies they had bred were developing as well as just visiting the puppy owners. The breed has come a long way since then and is now more widely recognized within the United States. One thing that still has not changed to this day is that conformation shows are still a place for gathering, visiting with fellow Leo owners, promoting your dogs or kennel, bringing the Leonberger to the public and to participate in the breed selection process.